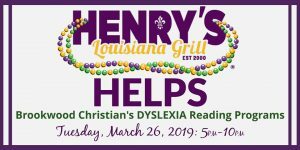 Join us for dinner at Henry’s Louisiana Grill as we wrap up celebrating National Reading Month AND our 2nd Annual #Ride2Read. Just leave your itemized receipt in the #HenrysHelps jar before you leave. Henry’s will donate 15% of food and non-alcoholic beverage sales to Brookwood Christian from the collected itemized receipts! Dine in or take out! 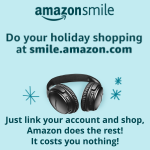 Make your reservations now if you are going to dine in!